The tiny island off the north coast of PNG's mainland erupted earlier this month. Over 600 residents were promptly evacuated from the island whose vegetation has been covered in ash. The Rabaul Volcanological Observatory said activity on Kadovar remains "dynamic" and that a continuous white steam plume is rising from its southeast vent up to 800 meters above the island. It said there were several "moderate" explosions from Kadovar at the weekend, and that the volcano's ash clouds had drifted hundreds of kilometers southwards. According to the Observatory, Kadovar's southeast coastal vent, which was significantly breached this month, glows red with lava at night. It said that due to the steepness of the volcano, and the lava dome formed on it, Kadovar's southern flank may collapse seaward. "The region to the south records a debris avalanche," said the Observatory in its latest situation report, warning that more landslides were possible. Both the national government and the East Sepik provincial government have advised local communities that there was a small risk a tsunami from Kadovar's volcanic activity. 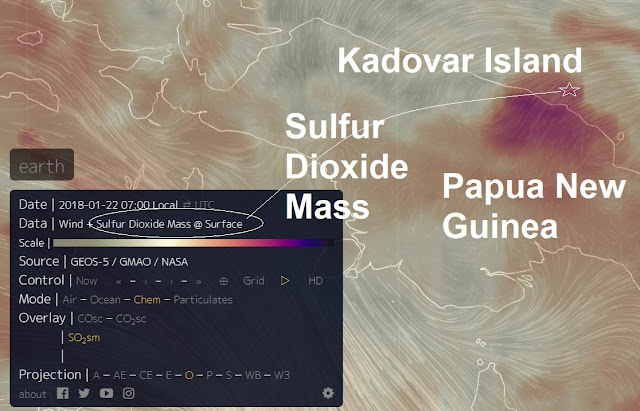 The Observatory explained that Kadovar's continuing sulfur dioxide emissions, clusters of high-frequency earthquakes, and the ongoing eruptive activity indicate that the situation is dynamic. "It is still possible, however, that any new magma may stall before it reaches the surface."